Your party is strung out along a crumbling ledge, fifty feet above a roaring torrent of water, out of spells and badly wounded, while a ravenous hippogriff circles ominously above. What do you do? 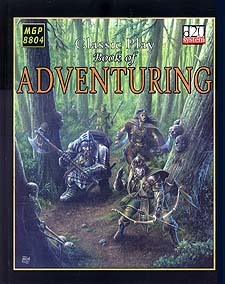 Designed for use by those role-players who are new to the hobby or those modest enough to admit that they do not already know it all, The Book of Adventuring leads you on to the road to becomming a better adventurer. This is only the tip of the iceberg, every element of the adventurer's craft is detailed in its own chapter, from surviving the dangers of the wilderness to the perils of extraplanar travel; from feeding yourself in the gloomy depths of a drow cavern to overcoming dangers of a very different kind as you make your way through the streets and alleys of a bustling city. Disparate enviroments they may be, but equally perilous. This valuable tome is the essential guide to all things adventuring. Recommended for players and games masters alike.